For Christmas this year, my wife and I took a trip back to the closest thing I have to a hometown, Knoxville Tennessee. 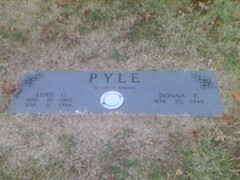 It was good to see my mother, and to visit some places that have deep meaning for me. We then went on to spend Christmas Eve and morning in Atlanta GA and Christmas Evening in Kingsport, TN, with my sisters and best friend (adopted brother) specifically. It was a good trip. But going back to Knoxville can sometimes be hard. When I woke up the morning after our arrival, I went on what has become a sort of pilgrimage for me… I made an early morning trek to some of the places in that town that hold deep meaning for me. I visited the church where I went to Boy Scout meetings, the Middle School and High School I attended, and the places where we used to hang out as kids. I visited the hill at the back of a subdivision where my friends and I used to take our dates to “park”. I visited the office of an employer with whom I did not part on the best of terms. I visited a house that I lived in but broke the lease to take a job somewhere else. I even added a new stop on this trip, and I paid silent respect at the entrance to the Tennessee Valley UU Church, which saw such tragedy this year. But beyond all of this, I visited my father’s grave. There is a history to my relationship with his grave. After he died I would not go to his grave for years… almost twelve years, in fact. I had convinced myself that by not going to the grave I was honoring his life, not his body. My father had never been in that place, why should I go there to remember him? In actuality, what I was doing was refusing to admit that he was dead. My three-month experience as a hospital chaplain helped me to see that, and it was during that time I first visited his grave. Since then, I have learned to see my father not through the worshipful lens of my youth, but rather through the understanding that he was a flawed human being, who had been deeply hurt in his life. He had a deep pain within him that never healed, and he did his best to cover it so that it was never seen. He never thought he deserved any happiness; that the poverty of his upbringing, the absence of his father, and the sins of his young adult years should have all but cursed him. He cared for his family as deeply as he did because the thought at any moment we might be snatched away. Instead, it was we who lost him, on March 9th, 1994. When I go back to Knoxville, one of the things that I encounter is all of the old guilt and even some new guilt that I carry around with me. I encounter how much of a little jerk I was to some of those young women who “parked” on West top hill with me. I encounter how my employer was not the only one at fault in the ending of that generic imitrex canada job. I encounter some guilt at the breaking of that lease. I encounter what an evil little Boy Scout I was. I encounter a lot of old mistakes and ill-advised behaviors from those years in that middle school and high school. And, I face in a fuller way the reality of the complex relationship with my father. I also face the continuing reality of my complex relationship with my mother and my sisters, and all of the insensitive, wrong, unaware, unthinking, and sometimes just plain mean things that were a part of my growing up in this family. I’m sure that I am not alone in this kind of reflection, while visiting family and former home-towns during the holiday season. As I was standing at my father’s grave, thinking of how unaware I was as a child of the deep pain he carried, and of how that unawareness made me horribly insensitive at times, a thought from my Zazen practice came to my mind. Come back to the breath. In Zen practice, coming back to the breath is a gentle thing, almost like a feather drifting. It is bringing your focus and awareness back to following your breathing, and away from the swinging from thought to thought, from distraction to distraction that the mind is so fond of. It is refocusing your attention on your breath, and through that focus seeking to become authentically present in the particular moment that you are inhabiting in its fullness. When I first began sitting Zazen, and even to a lesser extent today, one of my challenges was coming back to the breath without a series of self-recriminations and guilt (that are just another kind of distraction that the discursive mind likes to throw at you.) But coming back to the breath carries no such guilt or recrimination with it. At one level, realizing you mind is wandering and coming back to the breath (awareness) is Zazen, and so there is nothing to feel guilty about. You simply recognize what you mind is doing, and then come back to the breath. As I stood at my father’s grave, thinking of many of the places where I had been insensitive in our relationship, I felt the call to come back to the breath. To come back to the awareness of this moment, seeing his name carved into marble on a dew covered morning, with birds singing in a nearby tree and the sound of the city he loved in the background. I remembered to treat the moment and myself gently… to let go of the guilt and simply be with my father, with his memory for that moment. Perhaps we will someday… I get invited to preach in Knoxville from time to time. Thank you for the quote, it is an excellent one. This is a beautiful post. I’ve been doing zazen for a few years, and like you, I have many feelings of guilt and shame from my past. And lately, I’m coming to the sense that in sitting zazen, I’m touching base with a core reality, a larger one, more bedrock and larger than the place from which the thoughts of guilt and shame emerge. Whereas up to now (and I’m 60), I’ve felt as if my bedrock is those negative feelings, underlying everything I experience. So it feels like a profound difference. Many years of psychotherapy didn’t change this sense of what my bedrock is; zazen is the only thing that has done that.